I get headaches. Bad headaches. I also hate taking anything for said headache. The best solution I have found without having to go on migraine medicine is ice. Yes, plain old fashioned ice. The problem is that laying on a bag of ice cubes is less than comfortable. I tried the rice bags kept in the freezer but they seemed to warm up too fast. One day I came across a tip on how to make your own. I didn't bookmark it and was too lazy to go searching for it so through trial and error I found the right ratios. These bags were great! I could lay down on them and they were comfortable and they stayed cold for a very long time. Probably longer than what a Doctor would recommend freezing your brain. But I did say I get BAD headaches didn't I? A few weeks ago I had a hurt finger that required the use of ice packs to make the swelling go down. My husband got me all set up and put one of the quart size ice packs on my finger hand and my entire hand proceeded to freeze. I couldn't find a comfortable way to have the ice on my finger without putting myself in an awkward position. Now I cut one sponge in half for finger booboos and the rest I left whole for bigger ouchies. 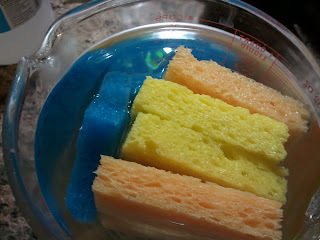 I then put all the sponges in the measuring cup and let them rest for around 1 minute to soak up what they could. I squeezed a little water out of them so they weren't dripping but left them plump. 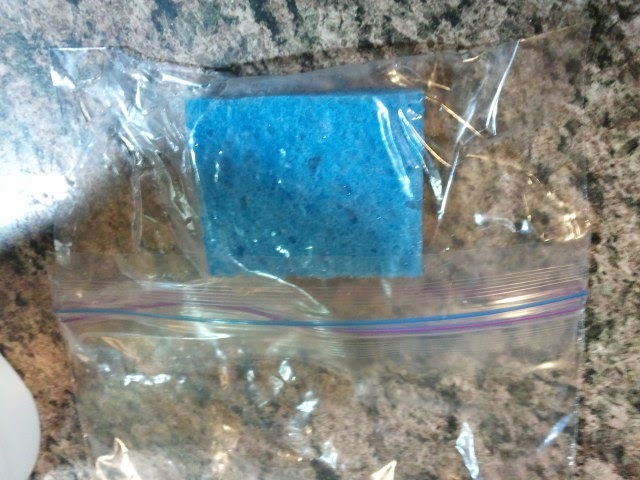 Place one sponge (I used snack size bags and they were a perfect fit.) inside of a bag. Push as much air out as possible and seal. Place that bag upside down inside of another bag. Push the air out and seal. Put them in the freezer and they'll be ready when you need an ice pack. 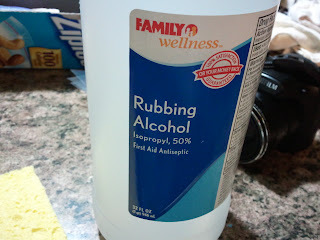 There was still plenty of leftover water/alcohol mixture so I used quart size freezer bags and split the liquid between two bags. I placed each of those upside down in another quart size freezer bag. Now I should be well stocked with ice packs. 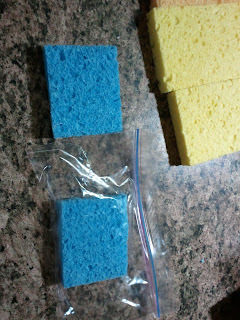 I do use the larger ice packs to put in lunch boxes to keep food cold all day. I only do this because I used sealed containers that IF the bag broke the food won't get alcohol in it. So far we have not had any accidents. Here is a really bad video showing you what they look like after they freeze. The bigger bag is one I already had made. The ones I made today aren't as solution heavy.